This guide explains the various functions that can be found in ImgBurn and it's structured in the same way as the ImgBurn menus. Note: The default setting is showed in blue in this guide. Lets you browse for and open a source file in ImgBurn. Applies for the modes: Read/Build-Device/Build-Image/Write/Verify. Lets you browse for and open a source folder in ImgBurn. Applies for the modes: Build-Device/Build-Image. Will remove all currently added files/images in the 'Build' modes 'Source' box. Lets you browse for and save a file from ImgBurn. Applies for the modes: Build-Image. Calculates the image size in the 'Build' mode. Starts the building of your project, as if you had pressed the button. Start the reading of the disc, as if you had pressed the button. Applies for the mode: Read. This will start the burning of the selected image or project, as if you had pressed the button. Applies for the modes: Build-Device/Write/Discovery. Starts the verifying process, as if you had pressed the button. Applies for the mode: Verify. Clears all previously added/selected items in the 'Source' and 'Destination' windows and restores any changed settings back to their default value, as if you had opened up the 'Build mode' for a new session. In 'Build' mode you can set up various options for a project. The 'Project' file holds the settings you have applied to your project in the 'Build' mode. The 'ImgBurn Backup Project' (IBB) file is a simple text file containing the names of folders and files to add to the image, along with the various configuration options. This function reloads the latest saved project. Lets you load a previously saved 'ImgBurn Backup Project' file. Saves the names of added folders and files along with the various configurations you have applied to your project into an 'ImgBurn Backup Project' (IBB) file. This function loads the latest saved 'ImgBurn Queue' (IBQ) file. 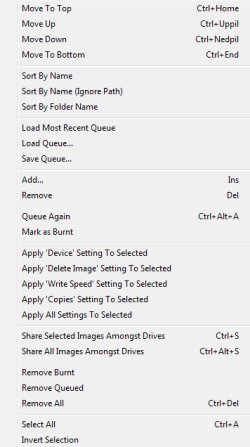 The 'ImgBurn Queue' allows you to load multiple CUE files and images in a burning queue just waiting to be burned. Applies for the mode: Write. Allows you to load any previously saved 'ImgBurn Queue' (IBQ) file. 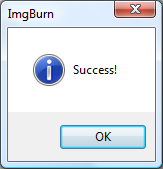 Saves the information of the queued CUE files and/or images you still haven't burned into an 'ImgBurn Queue' (IBQ) file. Saves the latest collected 'Graph Data' from a write/read task into an 'ImgBurn Graph Data' (IBG) file. You can the later on open up the file in either BurnPlot, DVDInfoPro or Opti Drive Control for viewing. Applies for the modes: Ez/Read/Build-Device/Build-Image/Write/Verify/Discovery. Allows you to view captured 'Graph Data' from a read/write task in either BurnPlot, DVDInfoPro or Opti Drive Control. You can see exactly what speed your drive was during read/write and when. This is an example from DVDInfoPro of the 'Graph Data' you will see. If you should see this message, when you try to display captured data, you need to enable the setting 'Capture Graph Data' in the tab 'Graph Data' in ImgBurn's 'Settings' window. Note: DVDInfoPro will not work with Windows 95/98/Me. Shows you a list of the latest loaded/saved images/files. With the 'Clear' option at the end of the list, you can clear the current list. Applies for the modes: Read/Build-Image/Write/Verify. This will terminate the program. 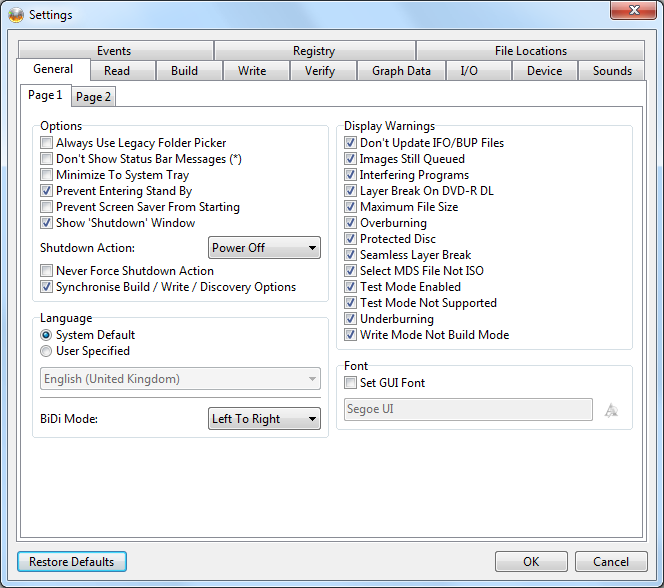 Turns on and off the Disc Layout Editor that's used in the 'Advanced' input build mode. You can find this feature explained in section '3.3.1.2 Advanced Input Mode' of this guide. In the 'Build' mode of ImgBurn you can drag and drop files and folders on the program window that you want to be included in the compilation onto the program window and also in the 'Write' mode you can drag an image (or .mds) file onto the program window that you want to be written. To avoid that the the program looses focus when you are in Windows Explorer as an example and have to click on the ImgBurn task bar icon to get it back to focus again, you can enable the 'Drop Zone' feature. It will show you a 'stay on top' window, where you can drag and drop your selected files/images onto, without the hazzel of having to bring ImgBurn program window to the foreground all the time. Instead of drag and drop, you can also copy selected files/images and then by right-clicking on the drop zone and selecting 'Paste', add them into ImgBurn. The Drop Zone function is available in the 'Build' and 'Write' modes. If you have 'minimized' ImgBurn and you want to 'restore it', you can double click on the drop zone to bring ImgBurn back to the foreground. The default setting is 'Disabled'. This log window will be enabled the first time you run ImgBurn. With this menu function you can switch the have it on or off. 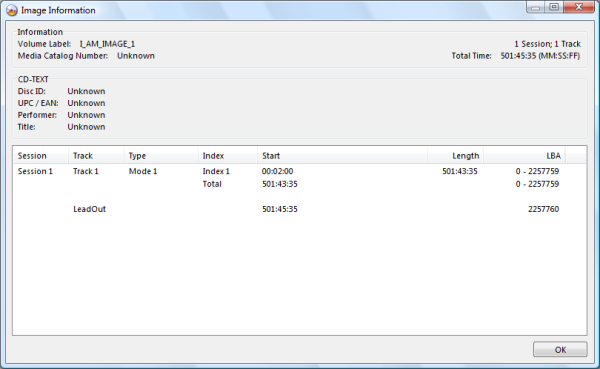 The ImgBurn log file is an extremely useful part of the program. It not only provides you with the details of every individual session. It helps you troubleshoot if any errors happen. Even if you select it to be off, it runs in the background and you can at any time turn it on again and watch what's saved in it. The setting 'Save the Log' in the tab 'Events' in the settings window (see section 4.15 of this guide) will allow ImgBurn automatically to save the log for you after exiting the program, which can be very helpful if you need to post a log file from a failed burn. That way you do not have to recreate it again. There are also options to append existing log or just overwrite previously saved log. Tip: You can double click a 'Destination File:' or 'Source File:' log entry (whilst holding down the CTRL key) to open up its containing folder in Windows Explorer. 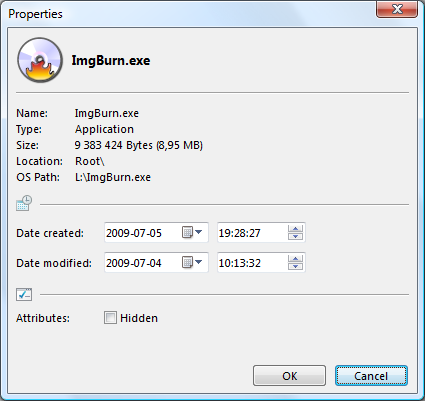 ImgBurn log files have as default the extension .log. This will create an empty log file window. This gives you the option to open up an already saved log file. This gives you the option to save the log file. This will send the contents of the log file to your printer. 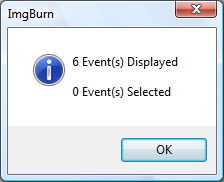 This will close the log window, but ImgBurn will still continue to add new log entries in it. Cut the selected part of the log file. Copy the selected part of the log file. Delete the selected part of the log file. Selects all rows of the log file. This will show you a window with statistics about your log file. The queue system will allow you to put several CUE files and images in a burning queue and then burn these in a row after each other. For the individual CUE files/images you can specify how many copies to burn, which drive to use, write speed and if you want to delete the file/image after the burning is done. It's not possible to write to several drives at the same time. Add the files/images that you want to queue. 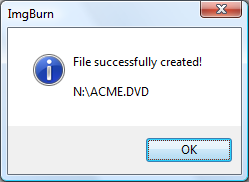 After that the first CUE file/image in the queue is burnt, ImgBurn will ask you to insert a new disc. 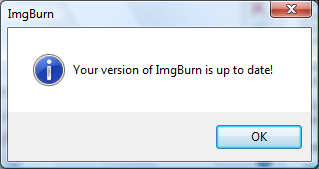 After that the new disc is inserted, ImgBurn will automatically start the burning of the new image in ten seconds. 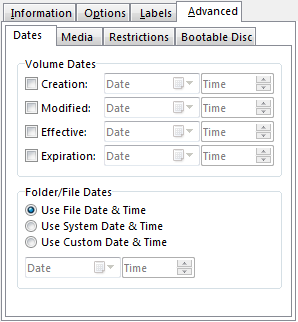 You can change this time by altering the setting 'Insert Next Disc - Auto 'OK'' in the tab 'Write' in the settings window. See section 4.15 of this guide. 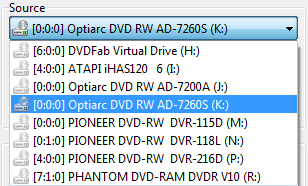 If you have several drives installed, you can select the desired one by clicking on the button. This function allows you to share selected images amongst drives. Assume that you have two drives installed. By selecting all entries in the queue and then pressing this button, every two will go to the first drive and the rest to the second drive. You can then load media in both drives and when the first drive is done, the second drive will then carry on. Deletes the image when and if the writing finished without any errors. By enabling the setting 'Check 'Delete Image' in the tab 'Write' in the settings window, you can have this option pre-checked. See section 4.15 of this guide. Loads the tray in the selected drive. Ejects the tray in the selected drive. You can here select the speed rate at which you want the write to be performed at. If you want to burn as fast as either the drive or the media is capable of, then select 'MAX'. If you want to write at a desired speed, then select that corresponding number at which you want to write at in the drop down box. The 'AWS' option will use the speed you have entered in the function 'Automatic Write Speed' for the media or combination of media and drive. If you haven't set any speed for it there, it will use 'MAX' speed. The 'Automatic Write Speed' function is explained in section 4.9 of this guide. You can also read more about it in the 'How to use the 'Automatic Write Speed' feature' guide. The default setting is 'AWS'. Sets the number of copies that you want to burn of the CUE file or image. A number between 1 and 100 can be selected. This function allows you to set the options for the drive to use, delete image or not, write speed and copies to several selected images at once. Applies all check marked options and their settings to the selected images. Applies the 'Device' setting to the selected images. Applies the 'Delete Image' setting to the selected images. Applies the 'Write Speed' setting to the selected images. Applies the 'Copies' setting to the selected images. Even if you should abort the burning of the images in the queue, ImgBurn will ask you to save the current queue. Use this button to browse to a folder and select one or several CUE file(s) or image file(s) that you want to be loaded into the queue list. Removes one or several selected CUE files or images from the queue. Removes all CUE files or images from the queue list. These arrows allows you to move around the selected items in the queue file list order. Moves the selected item(s) to the top. Moves the selected item(s) one step up. Moves the selected item(s) one step down. Moves the selected item(s) to the bottom. The 'Create CUE' function allows you to compile an Audio CD. This function is explained in section 4.4 of this guide. You can also use the 'How to burn an Audio CD from music files using ImgBurn, Supported files include Ape, Flac, Ogg, MP3, Wav and Wma.' guide on how to use the 'Create CUE' function. Starts the writing process. You need to have a blanc disc inserted in the drive to be able to press this button. If you want to export the captured 'Graph Data', you can click on the button. By clicking on the 'Graph Data' button, you can display 'Graph Data' created from the latest task by using either BurnPlot, DVDInfoPro or Opti Drive Control. A detailed walk-through on how to use the 'Queue' function can be found in the guide 'How to use the Queue'. Note: If you right-click in the queue list window you will see a pop up menu. Does a new initiation of the disc and reads it once again. Just as you had inserted the disc once again. 'Ez-Mode Picker' is the mode and window you will see when you start the program for the first time. It's a menu to the most common tasks that you can perform in ImgBurn. It's main purpose is to give newcomers to the program an easy way to pick the right mode for the task they would like to do. Switches you to 'Write' mode so you can select the image you want to write. Switches you to 'Build' mode with the option to write the created compilation to your drive. Switches you to 'Read' mode. Switches you to 'Build' mode with the option to save the created compilation to an image file on your hard disk. Switches you to 'Verify' mode. A function to assure you that the data written to the media is readable. Switches you to 'Discovery' mode. A function to explorer the quality of your combination of media and drive. Graphical Data can be exported and viewed in either BurnPlot, DVDInfoPro or Opti Drive Control. 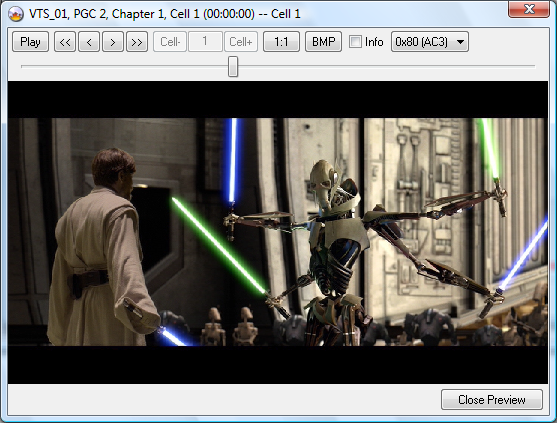 The 'Read' mode allows for basic (sector by sector) creation of images directly from a CD, DVD, HD-DVD or Blu-ray disc. The 'Sector Viewer' function can be used to monitor the contents on a CD or DVD disc. See section 4.2.13 of this guide for an explanation of this function. Opens up the 'Media Information' window that will tell you some basic information about your loaded media. This example is from an Audio CD. ImgBurn will open up the containing folder if you click on this icon. Use this button to browse to a folder where you want to save the created image file. If you want to save the image in your default 'Image Folder', then just write the name of the image file. You should let the program add the default file extension (BIN/IMG/ISO). You will see some warning/instruction pop-up windows, if you proceed to use a file extension that is not the normal standard for the image type you are creating. ImgBurn will convert plain MODE1/2048 discs as a MODE1/2352 image if you select it to be saved as a BIN/IMG file and also convert a MODE2/FORM1 track (on a single session/track disc) into MODE1 when saving it as an ISO file. You can also right-click on the 'file name' or the icon to bring up an options menu. The 'Edit' and 'Copy' menu items are only available if you right-clicked on the file name. Allows you to edit the currently selected destination. Copies the currently selected destination, so you can paste it in at another location. Brings up a list of your installed drives such as hard disks and allows you to quickly change the destination letter. Allows you to change just the path part of the file name, where you want to have the file saved. Shows you a list of the latest saved images paths and names. Shows you a list of the latest saved folders names. The left 'Read Speed' box sets the desired reading speed for a 'Data' source and the right 'Read Speed' box sets the desired reading speed for an 'Audio' source. The reason for the default '8x' for 'Audio' as source, is that there's no error correction on Audio tracks, so the slower the better really. The default settings are 'MAX/8x'. When the image is created you can automatically have it added to the 'Write Queue' list. This function is explained in section 2.4 of this guide. 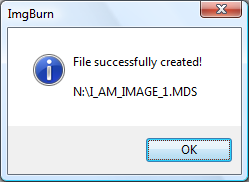 If enabled, ImgBurn will prompt you to insert the next disc just as Write mode does when burning multiple images/copies. This allows for automated reads when using an auto loader device. The button loads the tray in the selected drive and the button ejects the tray in the selected drive. You can use this button to browse to a folder where you want to save the created image file. If you want to save the image in your default 'Image Folder', then just write the name of the image file. Ejects the tray when the reading is done. By enabling the setting 'Eject Tray After...' in the tab 'Device' in the settings window, you can have this option pre-checked. See section 4.15 of this guide. This option is not available in 'Read' mode. Closes down ImgBurn when and if the reading finished without any errors. By enabling the setting 'Check 'Close Program' in the tab 'Read' in the settings window, you can have this option pre-checked. See section 4.15 of this guide. Shuts down the computer when and if the reading finished without any errors. By enabling the setting 'Check 'Shutdown Computer' in the tab 'Read' in the settings window, you can have this option pre-checked. It's also possible to set the desired shutdown action in the tab 'General' in the settings window. See section 4.15 of this guide. By clicking on the 'Cancel' button you can select to either abort the reading or set it to pause. You can then continue the task by pressing 'No' or 'Resume'. How to copy a disc with ImgBurn. How to create an image file from a disc with ImgBurn. The 'Build' mode will allow you to create an image file from files and folders to be saved on your computer or network - or you can write the files and folders directly to a disc. When you add files and folders to your project, you can either use the 'Standard' or the 'Advanced' input window. The first one is suited best when you are adding already existing files and folder structures, such as just to burn a DVD Video or Blu-ray Video. The 'Advanced' input window is where you have total control of the layout of the disc and can add new folders, change names etc. (i.e. you're no longer limited to burning an existing folder structure on your hard disc as-is). You can use the 'Information' window to calculate what type of media you need for your project when you have added the desired files and folders to be included in the final build. By pressing this icon your projects image size will be (re-)calculated and the 'Image Information' values will be updated. 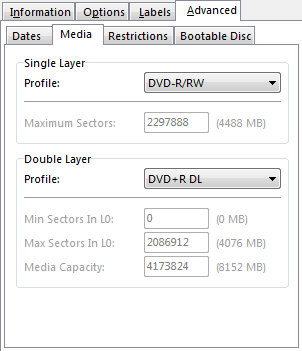 If you are calculating the size for a DL Video DVD, you will also be asked to set the layer break, so that the program can include the padding size for the final image size. If you want that ImgBurn should do the image size calculation in 'real time' as soon as you add or remove any file/folder from your project, you can enable this 'Auto Calculate' setting. If you are using the expanded window feature in the 'Standard' mode, it's easier to have it set to disabled, as you are not sent back to the main programs window every time you add a file or folder. After that you have added your files and folders to your project you can then use the 'Build Settings', described in section 3.3.2, to customize your project. ImgBurn have several built in warning messages to alert you if you try to select some settings that are not compliant to your project. At the final stage in the Build Mode, described in section 3.3.3, you can either decide to create an image file that will be saved on your hard disk for later burning or burn the project directly to your drive. With a 'Project File', you can at any stage save your current work on the project for later continuing or save the final project for recurring tasks, such as a simple backup of files and folders from your computer to a disc. You switch between 'Standard' and 'Advanced' Input Mode by clicking on either or , depending on the current 'Input Mode' you are in. Note: As you can have the output set to either 'Device' or 'Image File', some of the options and settings will not be available in the other output mode. This is the window where you add your files/folders to your project. By clicking on you can expand the size of the source list window. By clicking on the button again, you will return to the normal size. allows you to browse for files to be added to your project. Use when you want to do the same with folders. The blue arrows allows you to move the files and folders up and down in the project window. You can also right click in the project window and get a pop-up window that includes the most common tasks that you can perform in the window. If you want to remove a file or folder from your current project, select the items that you want to remove and click on the remove button. removes all the items from the source list. You can also use the drop down list to select previously added files/folders. Click on an item in the list and then click on to add the item to your current project. At any time, you can use the menu item 'File' -> 'Save Project', to save your current project, if you want to continue with it at a later stage or re-use it in the future. If you feel that the 'Standard' window is limiting you, the 'Advanced' window lets you have the total control of the layout of the disc and also allows you to drag files and folders from the explorer pane and add new folders and change file/folder names in your project. adds whatever is selected in the Explorer pane's Files box to the compilation. allows you to browse for files to be added to your project. Use when you want to do the same with folders. is used when you create new folders. The combo box in the top of the Disc Layout Editor window can be used if you want to type in a path to 'explore' from. You can also right click in the project window and get a pop-up window that includes the most common tasks that you can perform in the window. renames a file or folder in your current project. Note that even if you create new folders or rename files and folders, they are just renamed/created in your project window and not changed/created physically on your hard disk. By first marking an item and then clicking on , you can see the properties of your selected item. The function shows what type of media that is needed for your current project. If you have the check box marked, it will automatically switch between the type of media that is needed to fit the size or type of your project. If you unmark the check box, you can manually set it the desired disc type that you want to use for your project by selecting the appropriate item in the drop down list. At any time, you can click on the button , to save your current project, if you want to continue with it at a later stage or re-use it in the future. loads previously saved projects. When you are done with your project and want to either create an image file or burn it to a disc, you just click on the close button and you are returned to the ImgBurn main program window. 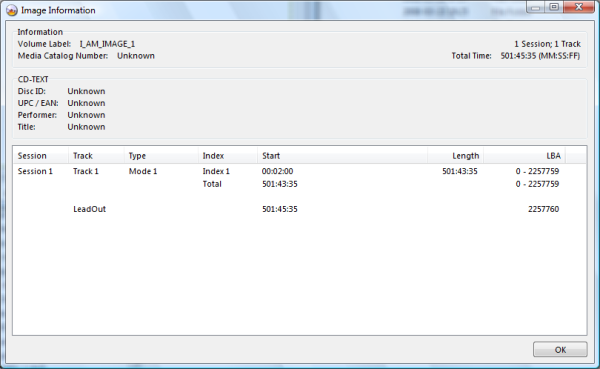 You can also click on the button to disable or enable the 'Explorer' style file manager pane in the Disc Layout Editor. It's also possible to switch to a more *Nero' like window style, where the Explorer/Disc panes are side by side (rather than stacked), by clicking on the button . These options and settings allows you to customize your project. ImgBurn has several built in warning messages to alert you if you have selected some settings that are not compliant to your project. 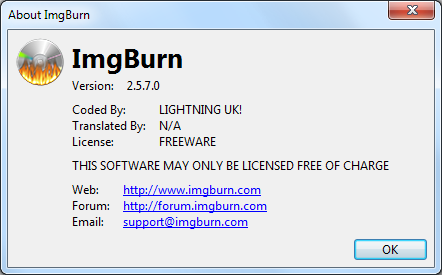 ImgBurn supports two basic modes that a file can be stored on a disc, MODE1/2048 or MODE2/FORM1/2352. If you should select the wrong 'Data Type', ImgBurn will warn you about it. MODE1 is intended for the storage of computer data. MODE1 sectors are the simplest type and is the normal method for putting data files on an optical disc. MODE2/FORM1 is quite similar to MODE1 as a sector in both formats contains 2048 bytes of user data, together with EDC and ECC (Error Detection and Correction Codes) bytes. It's used for the CD-ROM XA (eXtended Architecture) format. Only CD media supports the MODE2/FORM1/2352 data type. The file system that you want to be used for the disc/image. Will be using both file systems. Joliet is Microsoft's extension of the file format ISO9660. The extension includes that the file format supports Unicode and long file names. Most current PC operating systems, including Microsoft Windows 95 and later, Linux, Mac OS X, and FreeBSD, are able to read Joliet-formatted media. You should always add Joliet extensions to a data CD, the CD is still ISO9660 compatible, but carries more information for readers capable of interpreting the Joliet extensions. So you get both, better capabilities and full backward compatibility, for only a small price, which is additional space for the Joliet directory structure of the CD. Will be using all three file systems. Will be using both file systems. Used for DVD Video discs. The Universal Disk Format (UDF) is a format specification of a file system for storing files on optical media. It is considered to be a replacement of ISO9660. This file system is required for DVD, HD DVD and Blu-ray discs. 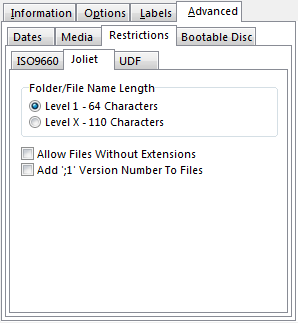 The 'Universal Disk Format' (UDF) version to be used as the file system. 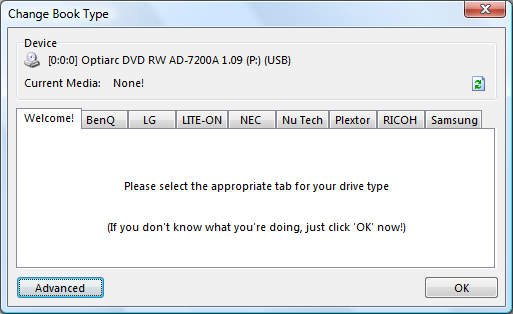 The 1.02 version is used by DVD Video discs. Version 2.5 and 2.6 are for HD DVD and Blu-ray discs. Preserves the full path of the files and folders. If you disable this setting you will only get 'My backup folder' and not something like 'C:Desktop\My backup folder'. 'Recurse Subdirectories' means that the program scans the subdirectories of any folder you add to the list (and the subdirectories of those subdirectories etc etc) - otherwise you'd only have files from within THAT folder. The default setting is 'Enabled'. 'Hidden Files' are special system files that Windows normally hides from view. 'System Files' are files that are a part of your Operating System. If you enable this option, only files that have been updated since the last backup will be included. The Archive Attribute is set whenever an existing file is either overwritten or modified (i.e., renamed or moved to another directory) by the file system. A new file is usually created with the Archive attribute set. The idea is to have an utility or application program to take the responsibility of clearing the Archive bit when a file is successfully backed up. The next system backup operation will be made much more efficient by focusing only on the files with the Archive attribute bit set which are either newly created or modified in any way since all the Archive attributes are cleared the last time (i.e., the last backup time). This will restore all the 'Build' settings to their default value. Enter the text you want to use as name for the 'Volume Label' for the various file systems. By clicking on the icon, you can get the current file format rows text to be automatically copied to the other file formats 'Volume Label' text field. If this option is enabled, everything that is typed in to one box will be typed in to all boxes automatically. 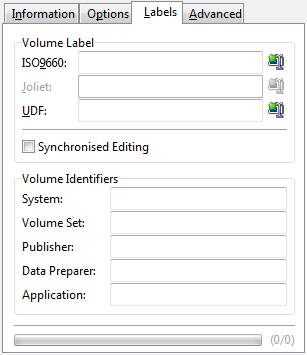 You can here enter the text that you want to use for the 'Volume Identifiers' descriptions. Lets you change the 'Volume Dates' fields to a user specified date and time stamp. You can either use the file, system or a custom date and time stamp for the files/folders in your project. Uses the files current Date and Time as the time stamps. Uses the Systems Date and Time as the time stamps. Allows you to define your own Date and Time to be used as time stamps. Note: This tab is only visible if you have selected 'Image File' as the 'Output' option. The purpose of this tab is to ensure that the image file is created right, depending on the media you plan to burn it to. Select the single layer media type that you plan to burn your project on. Maximum allowed size: 2295104 sectors/4482 MB. Maximum allowed size: 2297888 sectors/4488 MB. Maximum allowed size: 2236704 sectors/4368 MB. Maximum allowed size: 2294912 sectors/4482 MB. Allows you to set your own maximum allowed size. Useful if you plan to over burn your media or use 8CM 1.4 GB media. In the profile 'Custom' you can enter the desired sector size. For the other profiles, only the default size is showed. Select the double layer media type that you plan to burn your project on. Minimum allowed size L0: 0, Maximum allowed size L0: 2086912/4076 MB, Media Capacity: 4173824/8152 MB. Minimum allowed size L0: 2092896 4087 MB, Maximum allowed size L0: 2092896/4087 MB, Media Capacity: 4171712/8147 MB. Minimum allowed size L0: 0, Maximum allowed size L0: 2084960/4072 MB, Media Capacity: 4169920/8144 MB. Allows you to set your own minimum/maximum allowed sizes. This option should not be used for DVD-R DL media as the layer break is fixed and changing the options will most likely result in a write error. In profile 'Custom' you can enter the desired sector size. For the other profiles, only the default size is showed. ISO9660 only allows uppercase letters, digits and the underscore characters. It therefore converts all lower case letters to upper case, and all not allowed characters to underscores, if one of the ISO level standards is selected. If you are creating a 'Windows Operating System installation image/disc', then select the option 'Level X - 219 Characters'. File names are limited to eight characters with a three-character extension, using upper case letters, numbers and underscore characters only. MS-DOS and Windows 3.x computers usually only support the 8.3 naming standard. 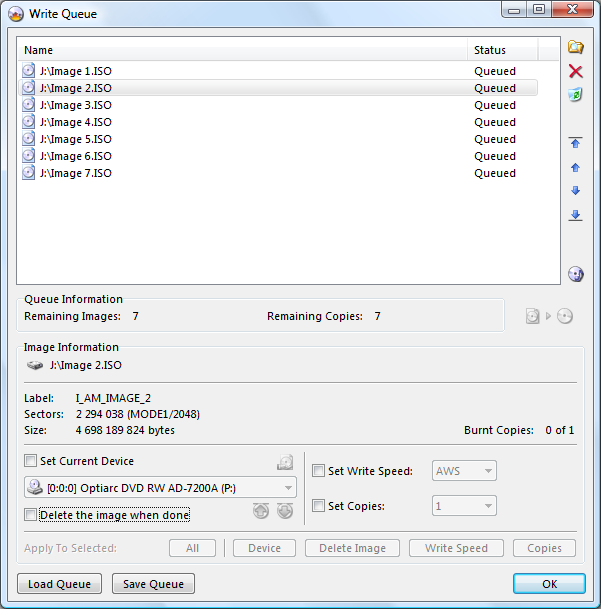 If you are preparing an image which should be readable from such computers, be sure that all the filenames are in that format. File names are not limited to 11 characters (the 8.3 format) but the base name may be up to 27 characters long (total file name length not to exceed 31 characters). Thus, this format is sometimes referred to as the “27.3” format. Windows 95 and later versions supports level 2. 'Level X' as in 'Level Extreme'. This level might not work on all systems. Use it with care. If you are creating a 'Windows Operating System installation image/disc', then select 'DOS'. Also known as ISO9660. Only capital letters, digits and underscores are permitted. DOS permits some other punctuation marks, besides the ones allowed under 'Standard'. Standard ASCII character codes permitted. This setting might not work on all systems. Use it with care. If you are creating a 'Windows Operating System installation image/disc', then enable this setting. 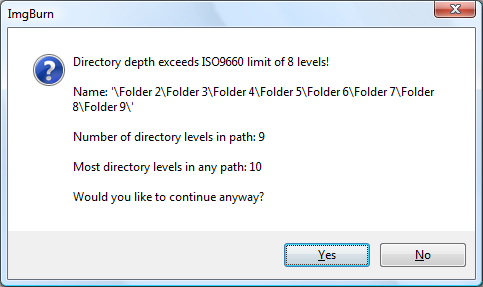 Even if this setting is disabled and you are building an image that contains more than 8 directory levels, ImgBurn will ask you if you want to ignore the ISO9660 directory depth message on a 'one time only' basis. Allows for files that lack extensions such as .exe, .txt, or .com. 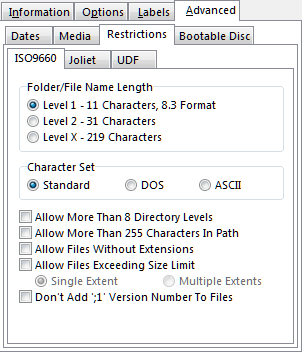 Allows you to add files that exceed the limit imposed by the ISO9660/Joliet file systems. Those file systems will record the file size as 4GB (-1 byte) but all their data will be physically present in the image. The UDF file system will use the correct size. You can also decide between single and multiple extents when allowing files that exceed 4GB in the file systems. Single fakes the size to 4 GB. Multiple allows for the full size but isn't compatible with all parsers. The default settings are 'Disabled' and 'Single Extent'.. Indicates whether to add the string ';1 ' to the ISO filenames (a semicolon followed by a number at the end of every filename). The string ';1 ' is the "file version" and according to ISO9660 it's a mandatory part of the filename. The default setting is 'Disabled. Shortcut to configure the ISO9660 file system restrictions according to the 1988 specifications. ISO 9660:1988 is the original ISO 9660 standard. Shortcut to configure the ISO9660 file system restrictions according to the 1999 specifications. Joliet is Microsoft's extension of the file format ISO9660. The extension includes that the file format supports Unicode and long file names. Most current PC operating systems, including Microsoft Windows, Linux, Mac OS X, and FreeBSD, are able to read Joliet-formatted media. Readable by Windows 95 or later. The Universal Disk Format (UDF) is a format specification of a file system for storing files on optical media. It's considered to be a replacement of ISO9660. ASCII text will be used if disabled, instead of support for using an international character set. By default, Unicode support is disabled for DVD Video content. When enabled, Unicode is not disabled for the AUDIO_TS, JACKET_P and VIDEO_TS folders. 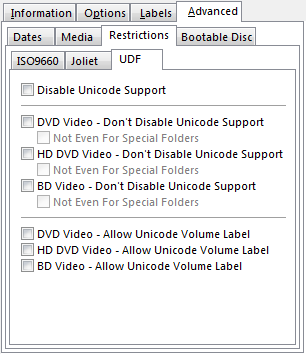 By default, Unicode support is disabled for HD DVD Video content. When enabled, Unicode is not disabled for the ADV_OBJ and HVDVD_TS folders. By default, Unicode support is disabled for BD Video content. When enabled, Unicode is not disabled for the BDAV, BDMV and CERTIFICATE folders. 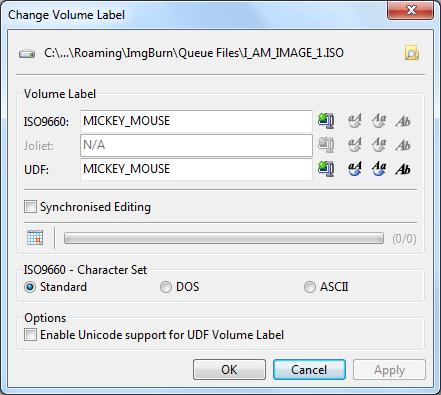 By default, Unicode is not allowed for the volume label. 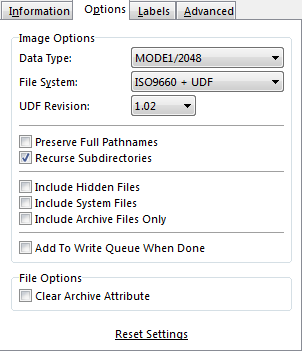 This option allows for non compliant file/folder creation dates in the UDF file system (only applies to UDF 2.00+). As an example I'm going to create a bootable Windows XP image/disc based on my original Microsoft installation disc. There are various modes you can create this depending on if you have the original Microsoft disc or if your system was preinstalled by the computer manufacturer and if you are going to include service packs or additional driver files. There are plenty of guides for these cases to find through Google. I start off by using the option 'Extract Boot Image', before I (can) fill in the other settings in this window. If you are creating an 'Operating System installation' image/disc, then enable this setting. ImgBurn will also do some additional checks for you when you start the building to ensure that the right settings have been applied, as soon as it detects the I386 folder. 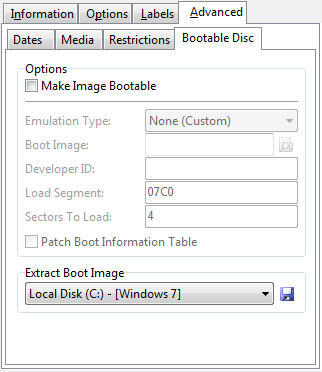 In my example I have already extracted the boot image from my original Microsoft installation disc, by using the 'Extract Boot Image' function, so I select 'None (Custom)' to be able to manually set the options 'Developer ID', 'Load Segment' and 'Sectors To Load'. I have extracted the boot image to my hard disk as 'J:\BootImage.ima', so I use the browse button to load that file, just as the information from the ImgBurn log told me. I fill in the information from the ImgBurn log. In my case 'Microsoft Corporation'. I fill in the information from the ImgBurn log. In my case '07C0'. The default setting is '07C0'. I fill in the information from the ImgBurn log. In my case '4'. When building a Vista/Windows 7/Windows 2008 bootable installation disc, the value should be 4 for a 2KB ETFSBOOT.COM file and 8 for a 4KB one. The default setting is '4'. Option when creating a bootable disc to have the program patch the 'Boot Information Table'. You shouldn't enable this option when building a Vista/Windows 7/Windows 2008 bootable installation disc (i.e. using an 'ETFSBOOT.COM' boot image). The 'Patch Boot Information Table' option is only available when 'Emulation Type' is set to 'None (Custom)'. Insert the media that holds the boot sectors to be extracted and press the extract button and then select a place to save the extracted boot image to. If you now look in the log, this is what gets up in there (just an example). I 00:00:00 Wrote 2 048 bytes to boot image file. I 00:00:00 Operation Successfully Completed! 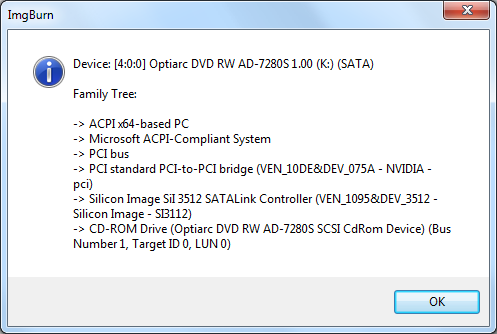 This information is then to be used for the other options in the 'Bootable Disc' window. Note: There are also two additional guides 'How to create a Windows XP installation disc, Slipstream a service pack and burn a new disc' and 'How to create a Windows Vista / 7 installation disc, that covers the 'Bootable Disc' function. After that you are done with adding files/folders to your project and you eventually have changed some options and settings, you are now ready to build your project. You can either create an image file for later burning or burn the project directly to a disc. You can switch between the two output modes 'Device' or 'Image File', by clicking on either the or the icon, depending on the current mode you are in. You will first need to select the drive you are going to use if you have several drives installed. 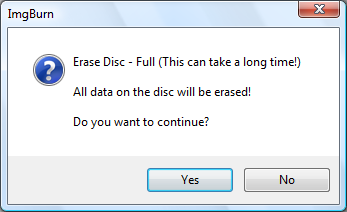 The erase button will allow you to erase the disc if it's desired. ImgBurn will ask you which type of erase it should perform. If the +RW/BD media has not been previously formatted or is in the need for a full erase the 'Quick' option is disabled. A proper erased/formatted +RW media can then just be overwritten the next time you write to it without the need to first do an erase. -RW media always needs at least a quick erase before a new writing. This is the fastest of the two modes as the deleting will be done by writing zeros to the first 800 sectors. ImgBurn will write zeros to the full disc. This erase will take the same amount of time as it will take for a regular writing to the media at MAX speed. 'Test Mode' will fake a burning. Every step involved in a real burning will be carried out, except turning on the laser. It also gives a check that your writer can deal with the commands that is sent to it during the write phase. As the laser beam is never activated, it can't test that the media will burn without burn fails, generated by bad write quality. 'Test Mode' is not supported for +R/+RW media. If you want to verify that your compilation has been written properly to your disc you can select this option. It will re-read your burned disc and compare it to the original source file(s). The 'Verify' option is disabled if you have selected the 'Test Mode' option. Note: This tab is only visible if you have selected 'Device' as the 'Output' option. If you want to burn as fast as either the writer or the media is capable of, then select 'MAX'. If you want to write at a desired speed, then select that corresponding number at which you want to write at in the drop down box. The 'AWS' option will use the speed you have entered in the function 'Automatic Write Speed' for the media or combination of media and drive . If you haven't set any speed for it there, it will use 'MAX' speed. The 'Automatic Write Speed' function is explained in section 4.9 of this guide. You can also read more about it in the How to use the 'Automatic Write Speed' feature guide. Sets the number of copies that you want to burn of your created project. A number between 1 and 100 can be selected. The default setting is '1'. Opens the function 'Automatic Write Speed', that can be used if you want to change/add a default write speed for the media or combination of media and drive. This function is explained in section 4.9 of this guide. Opens the function 'Advanced Settings', in where you can change specific settings for your drive, such as speed and write performance. This function is explained in section 4.2.11 of this guide. Opens the function 'Change Book Type'. If your combination of firmware and drive supports it, it will allow you to change the physical format of the disc to DVD-ROM for DVD+R, DVD+RW and DVD+R DL media. The purpose of this is to allow certain standalone DVD players to perform better when playing burned media. This function is explained in section 4.2.12 of this guide. By clicking on the 'Build' button, the building process starts with the writing to disc. If you have enabled the 'Verify' option, the verify stage will be conducted. Ejects the tray when the operation is done. By enabling the setting 'Eject Tray After...' in the tab 'Device' in the settings window, you can have this option pre-checked. See section 4.15 of this guide. This option is not available if you have selected 'Image File' as the output option. Verifies the disc after that the writing phase is done. This option is not available in 'Build' mode. Closes down ImgBurn when and if the operation finished without any errors. By enabling the setting 'Check 'Close Program' in the tab 'Build' in the settings window, you can have this option pre-checked. See section 4.15 of this guide. Shuts down the computer when and if the operation finished without any errors. By enabling the setting 'Check 'Shutdown Computer' in the tab 'Build' in the settings window, you can have this option pre-checked. It's also possible to set the desired shutdown action in the tab 'General' in the settings window. See section 4.15 of this guide. By clicking on the cancel button you can select to either abort the current task or set it to pause. You will first need to select where you want to save your image file. You can also right-click on the icon to bring up an options menu. Sets the path to a folder location that has previously been used. Assume you have used the folder 'J:\My Builds' before and you now only have entered the file name on the destination row. To add the previously used folders location before the file name, you can do it by this function. Shows you a list of the latest saved images paths and names. You can pick one and have it added to the destination row. Shows you a list of the latest saved folders names. You can select one that has been used previously and have it to be copied into the destination row. Everything that has been entered before is replaced by the new location. You still need to add a desired file name that will be saved in the folder location. ImgBurn will open up the containing folder if you click on this button. By clicking on the 'Build' button, the building process starts with the image creation. ImgBurn Build Mode, An Overview. 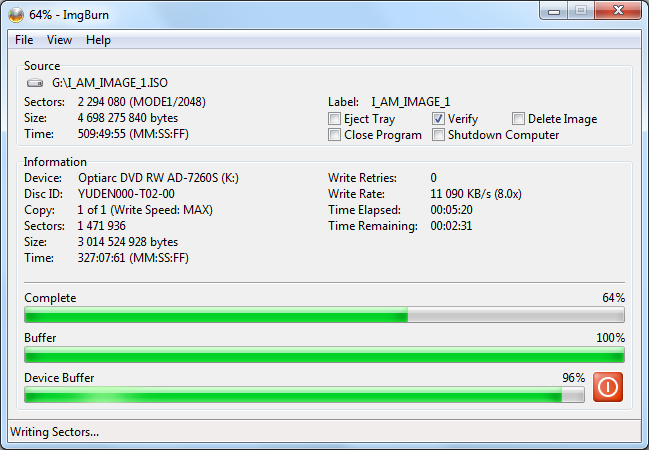 Creating a double layer ISO on your hard drive using ImgBurn. 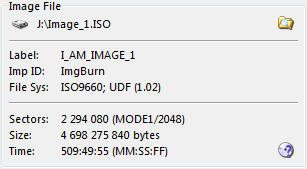 Creating a single layer ISO on your hard drive using ImgBurn. Burning DVD Video files directly to double layer media with ImgBurn. Burning DVD Video files directly to single layer media with ImgBurn. 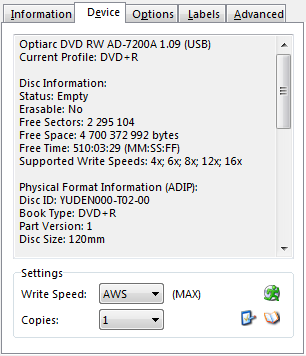 How to write DVD Video (IFO/BUP/VOB) files to a double layer disc. 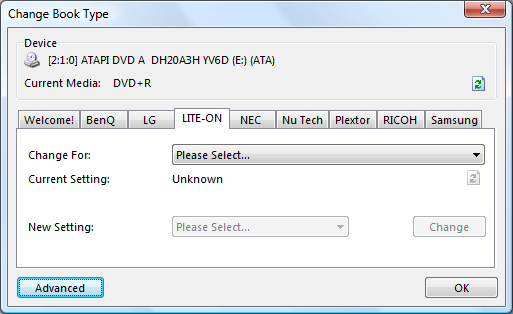 The 'Write' mode is used to write a CUE or an image file to a CD, DVD, HD-DVD or Blu-ray disc. Note: If you hoover with the mouse over the 'Label' field, you will see some more information about the loaded image file. 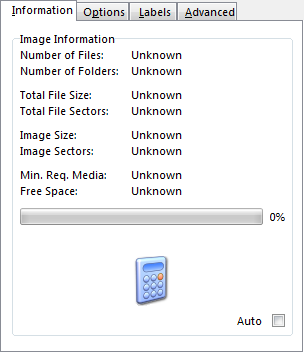 Use this button to browse to a folder and select a CUE or an image file, that you want to be loaded into the program. You can also press the queue button to start the 'ImgBurn Queue' manager. In this manager you can add several CUE and image files at the same time and then let ImgBurn burn them in a row after each other. The CUE function allows you to compile an Audio CD. This function is explained in section 4.4 of this guide. You can also read more in the 'How to burn an Audio CD from music files using ImgBurn, Supported files include Ape, Flac, Ogg, MP3, Wav and Wma' guide. 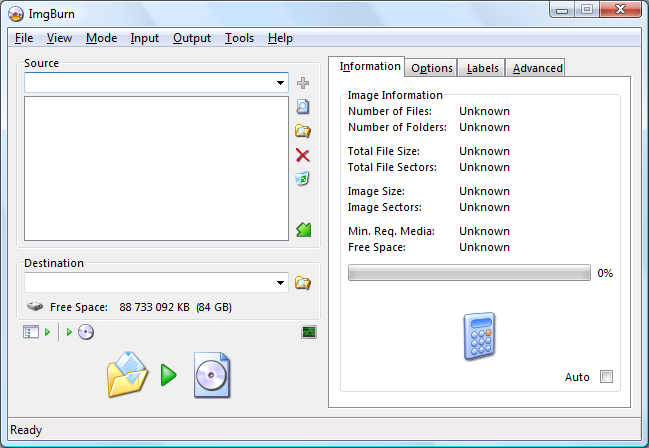 Opens up the 'Image Information' window, that will tell you some basic information about your loaded image file. This example is from a DVD. If you hold down 'CTRL' when clicking the 'Image Information' button, the program will do a dummy decode pass on any audio files that make up that image to get an accurate duration. 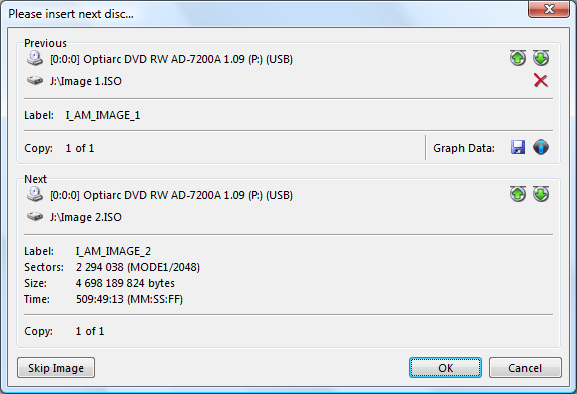 If you want to verify that your image has been written properly to your disc you can select this option. It will re-read your burned disc and compare it to the original source files or image. The 'Verify' option is disabled if you have selected the 'Test Mode' option. By clicking on the 'Graph Data' button, you can display 'Graph Data' created from the latest task by using BurnPlot or DVDInfoPro. The 'AWS' option will use the speed you have entered in the function 'Automatic Write Speed' for the media or combination of media and drive. If you haven't set any speed for it there, it will use 'MAX' speed. The 'Automatic Write Speed' function is explained in section 4.9 of this guide. You can also read more about it in the How to use the 'Automatic Write Speed feature' guide. Opens the function 'Automatic Write Speed', that can be used if you want to change/add a default write speed for the media or combination of media and drive. This function is explained in section 4.9 of this guide. You can also read more about it in the How to use the 'Automatic Write Speed feature' guide. Opens the function 'Advanced Settings'. In this function you can change specific settings for your drive, such as speed and write performance. This function is explained in section 4.2.11 of this guide. Opens the function 'Change Book Type'. 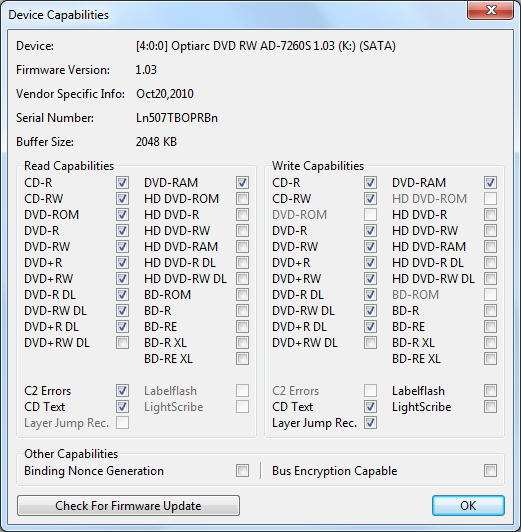 If your combination of firmware and drive supports it, it will allow you to change the physical format of the disc to DVD-ROM for DVD+R, DVD+RW, and DVD+R DL media. The purpose of this is to allow certain standalone DVD players to perform better when playing burned media. This function is explained in section 4.2.12 of this guide. If you also have selected the option 'Verify', this stage will also be performed. Closes down ImgBurn when and if the operation finished without any errors. By enabling the setting 'Check 'Close Program' in the tab 'Write' in the settings window, you can have this option pre-checked. See section 4.15 of this guide. Shuts down the computer when and if the operation finished without any errors. By enabling the setting 'Check 'Shutdown Computer' in the tab 'Write' in the settings window, you can have this option pre-checked. It's also possible to set the desired shutdown action in the tab 'General' in the settings window. See section 4.15 of this guide. How to write an image file to a disc with ImgBurn. 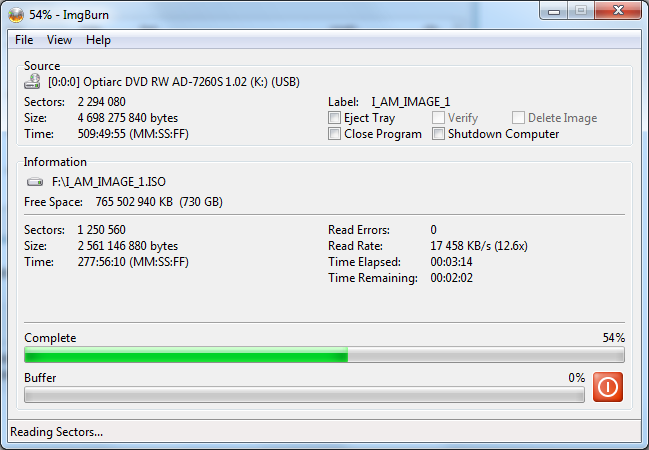 How to burn a Blu-ray Video disc using ImgBurn. How to use the Queue. How to use the 'Automatic Write Speed' feature. The 'Verify' mode is used to check that a disc is 100% readable. Optionally, you can also have ImgBurn to compare it against a given image file to ensure that the actual data is correct. There are two modes in which the verifying can take place. 'Verify Against Image File' will compare the burned disc against your image file that you used as source for the burned disc. If you disable this setting, ImgBurn will only verify that the disc can be read. Use this button to browse to a folder where you have saved the image file, that you want to compare the burned disc with. Opens up the 'Image Information' window that will tell you some basic information about your loaded media. The left 'Read Speed' box sets the desired reading speed for a Data source and the right 'Read Speed' box sets the desired reading speed for an Audio source. The default settings are 'MAX'. This option is not available in 'Verify' mode. Deletes the image when and if the verifying finished without any errors. By enabling the setting 'Check 'Delete Image' in the tab 'Verify' in the settings window, you can have this option pre-checked. See section 4.15 of this guide. This option is only available if you selected the option 'Verify Against Image File'. Closes down ImgBurn when and if the verifying finished without any errors. By enabling the setting 'Check 'Close Program' in the tab 'Verify' in the settings window, you can have this option pre-checked. See section 4.15 of this guide. Shuts down the computer when and if the verifying finished without any errors. By enabling the setting 'Check 'Shutdown Computer' in the tab 'Verify' in the settings window, you can have this option pre-checked. It's also possible to set the desired shutdown action in the tab 'General' in the settings window. See section 4.15 of this guide. By clicking on the 'Cancel' button you can select to either abort the current task or set it to pause. The 'Discovery' mode is useful if you want to put your drive / media to the test! Used in combination with either BurnPlot, DVDInfoPro or Opti Drive Control, you can check the quality of the burns your drive is producing. This option will write dummy data to all 'Free Sectors' on the media, i.e. the whole disc. Lets you write dummy data up to a certain sector on the media. You can use this button if you want to set the 'Custom' value to equal the free sectors on the current loaded media. It also gives a check that your drive can deal with the commands that is sent to it during the write phase. As the laser beam is never activated, it can't test that the media will burn without burn fails, generated by bad write quality. The 'AWS' option will use the speed you have entered in the function 'Automatic Write Speed' for the media or combination of media and drive. If you haven't set any speed for it there, it will use 'MAX' speed. The 'Automatic Write Speed' function is explained in section 4.9 of this guide. Opens the function 'Automatic Write Speed', that can be used if you want to change/add a default write speed for the media or combination of media and drive. This function is explained in section 4.9 of this guide. You can also read more about it in the 'How to use the 'Automatic Write Speed' feature' guide. This option is not available in 'Discovery' mode. If you have an already created image file and you want to change the existing 'Volume Label' name for the various file systems, this function allows you to do that. Select the image file that you want to change the names for by using the folder button to browse to the location of the desired image file. Copies automatically the content of the current file system rows 'Volume Label' text, to the other two file systems 'Volume Label' text field. Makes all entered text for the actual file system to be in uppercase style. I.e. 'This is the volume label', will be changed to 'THIS IS THE VOLUME LABEL'. Makes all entered text for the actual file system to be in lowercase style. I.e. 'THIS IS THE VOLUME LABEL', will be changed to 'this is the volume label'. Makes all entered text for the actual file system to be in Title Case style. I.e. 'THIS IS THE VOLUME LABEL', will be changed to 'This Is The Volume Label'. Writes the current date and time to all file systems 'Volume Label' text field. Any previous text will be overwritten. Note: The 'Uppercase' / 'Lowercase' / 'Title Case' buttons for the ISO9660 volume label fields are only enabled when using the 'ASCII' character set. Useful if you are using an international character set. The 'Apply' button will do the same as the 'OK' button, but it will not terminate the window. This function will display the layer break information on a double layer disc image. It's also possible to preview the cell before and after the layer break. Note: If you right click on a row, you'll get a context menu. The REZERO UNIT command positions the laser head of the drive to the zero track (LBA 0) and basically reinitialises the drive. This command exists for command compatibility and it works on several drives. This function tells the drive to work at the speed you have selected in the drop down list, a speed that's then used by whatever other program happens to be using it. 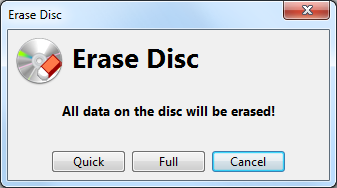 The 'Erase Disc' function will allow you to erase a rewritable disc if it's desired. ImgBurn will ask you which type of erase it should perform. If the +RW/BD media has not been previously formatted or is in the need for a full erase ImgBurn will tell you so. A proper erased/formatted +RW media can then just be overwritten the next time you write to it without the need to first do an erase. -RW media always needs at least a quick erase before a new writing. Wipes out the whole disc. This takes longer time than the 'Quick' version above. The 'SmartErase' function will rewrite CD-R/DVD±R with random meaningless characters so that the original data and the disc will be "destroyed". Once you "SmartErased" a disc, you don't have to worry about that someone will access the confidential data from the disc you dumped. ImgBurn will ask you which type of erase it should perform. Note that you need to have a a SmartErase-capable drive installed, like the latest generation 22x DVD rewriters from Lite-On. Quick Erase erases only the information stored in Lead-in area and data stored on the first track. Once the information in Lead-in area is destroyed, the drive cannot find the location where the data is stored. Therefore the data can not be read. Though some data recovery may have the chance to recover data from areas where data has not been overwritten. Pros: Takes less time to destroy a disc. Cons: Data on the disc may have the chance to be restored by data recovery software. Full Erase erases all the disc, from Lead-in to Lead-out area of every session on the disc. The data on a full erased disc will no longer be restored. 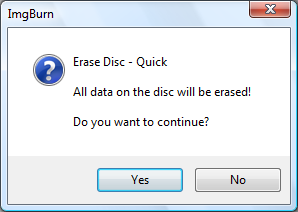 Pros: Fully destroy the information and data on the disc. Data on the disc will no longer be restored. Cons: Takes a longer time to destroy a disc. The command flushes the cached buffers to media which makes it possible to resume the data flow. Synchronise Cache is used after a failed burn (not needed if you burnt with ImgBurn because it performs that operation regardless). It basically tells the drive that the write operation has finished and that it's to finish writing everything in it's cache to the disc and basically clean up after itself. If your burned disc has not been properly closed, you can do it here. Closes the last track on the disc, as reported by the disc information command. 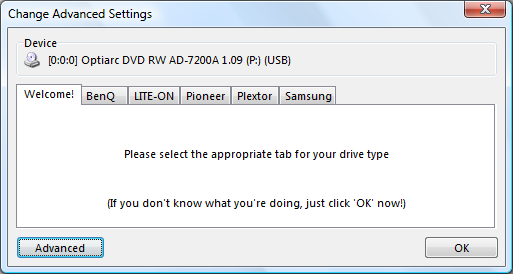 Here you can change some advanced settings if you have a BenQ, Lite-On, Pioneer, Plextor or Samsung drive. Note: Older drives might not support these settings. Makes it possible to write a 4x or 8x rated DVD +/-R disc at 8x or higher speeds. With SolidBurn, the theory is that you need not update the firmware constantly. The drive itself ensuring an optimal writing strategy on all DVD +/-R media. SolidBurn has it’s own self learning algorithm to allow DVD+/-R media to be written with increased quality. This option is if the media code is known in the currently installed firmware version. Same function as the above one, except that this option is used if the media code is unknown in the currently installed firmware version. Allows for test writing to DVD +R/+RW/+R DL media. If enabled, the whole burning process will be simulated, but the laser will never be turned on. The purpose is to ensure that data can successfully be written onto the disc. So when ImgBurn reports that the burning was successful or failed under 'Test Write' enabled mode, you know that 'Test Write' has done its job. There will be no other messages shown. The drive will remain writing data in simulation mode until you either change this setting or reboot your computer. Walking Optimal Power Control (WOPC) is enabled by default, the laser power will be dynamically adjusted according to disc condition. During power adjustment, the drive will pause for some nano-seconds. There are two scenarios where WOPC can be disabled. With superb and defect-free media, WOPC can be disabled to reduce burning time. With low-speed (<4x) and poor-quality DVD -R media, WOPC can be disabled to increase successful burning rate. It will remain disabled until you either change this setting or reboot your computer. Hyper Tuning - Auto Write Strategy (AWS) is a technology for the drive to automatically find the optimal writing strategy for each different media. If the drive supports Hyper Tuning, it will use Hyper Tuning to write for unknown, or unsupported, DVD±R and DVD±R DL media only. If you want to use this function for all media, you need to enable this feature. HyperTuning also works with supported media. When enabled, the drive will ignore the writing strategy stored in the firmware and instead create a new one. This is very useful if you are trying to record a disc that uses another company's MID code (I.E. fake TYG02 code discs). According to Lite-On, drives that support HyperTuning can store in the memory up to five writing strategies. With each new burn, these writing strategies are further optimized until the maximum possible writing speed is achieved. To let the drive check the write quality during recording and modify the writing strategy in real-time, in order to get better writing quality. It may take more time for the recording if you enable this feature. If you want to write the media in higher writing speed than the media is rated for, you need to enable this feature. OverSpeed does have some limitations. To prevent people from writing to all DVD±R media at 16x, the writing speed can only be bumped up one level. For example, if your disc was normally supported at only 8x, the writer would now give you the option to write to it at 12x. Oddly enough, this does not apply to DVD±R DL media. OverSpeed relies heavily on HyperTuning. When a disc is written at a higher than the normal speed, HyperTuning will automatically create a new writing strategy for it. For each particular writing session and for each used brand of media, SmartWrite optimizes the writing strategy and automatically memorizes this strategy for every recordable media the drive has ever burned. Through this self learning mechanism you can make good quality burns with all media including cheap no-brand media without the need to update firmware. Simply enable SmartWrite, insert your disc and burn. The new writing strategy is then created during the burn process. The writer collects 'learning data' on how to best burn the discs from the burning sessions. This 'Optimum Power Calibration' (OPC) history can be cleared with this function. Every time you flash new firmware, the OPC is cleared automatically. This function priorities writing quality by automatically adjusting writing speeds for high speed DVD-R/+R media that is inserted into the drive. Important Note: your drive must have firmware V1.06 or higher on a DVR-116/216, to operate correctly with the Optimal Writing Speed function. The same function as above, except that it will be enabled even if you use other burning programs. For the best writing quality, the drive's AutoStrategy technology selects the optimized write strategy for every DVD disc and, if necessary, creates a new write strategy for unknown media. This function is only available for DVD +R and DVD -R media (4X and higher). Plextor Optimized Writing Error Reduction Control (PowerRec) adjusts the laser power and writing speed so they're at the optimum settings for that particular disc. Using real-time monitoring of the write data, PowerRec can increase or decrease write power and speed to guarantee the best possible writing quality with whatever brand media is used. The stated purpose of Magic Speed is 'to select and use a reading speed from the ROM DRIVE between the max speed mode and the low noise mode'. It doesn't control recording speed or reading speed for a DVD. 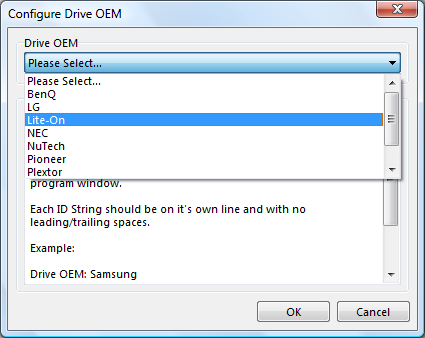 If you have an OEM drive from BenQ, LG, Lite-On, NEC, NuTech, Plextor, Ricoh or Samsung, this function makes it possible to add the OEM drive in a table, so that ImgBurn can read the current status setting(s) that you have applied. If you have already applied this in the 'Advanced' feature in the 'Change Book Type' function (section 4.2.12 of this guide), there is no need to do it here as it's the same function. 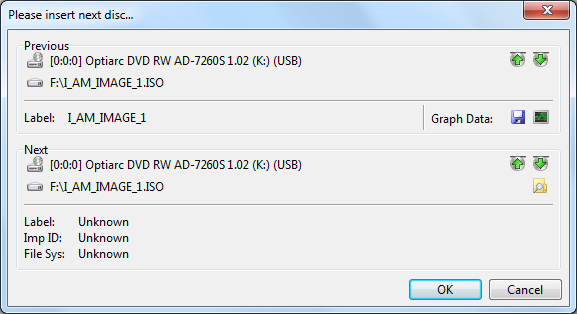 As an example I will use my 'SONY DVD RW DW-Q30A' drive, a re badged Lite-On SHW-1635S drive. Select the 'real' manufacturer of your drive in the 'Drive OEM' drop down box. Type in the ID string of your drive as it's visible within the main program window. The next time you write to a disc, you will have any of the enabled Lite-On features for the drive to show up in the log. If you are burning with +R/+RW/+R DL media and your drive supports book type, also called bit setting, you can use this function. It will fool your stand alone player that the burned disc is a DVD-ROM, which in some cases makes them more compatible with players. Especially with older players it can do the trick. Only +RW media can change the book type after recording, so for +R media you need to apply the book type setting prior to the writing. Note: You can use the refresh button to re-load the settings. As an example I will use my Lite-On drive 'ATAPI DVD A DH20A3H'. Select 'Drive (For DVD +R Media)'. Depending on the brand of the drive, there might be various options for each media type. These are the Lite-On options. Select the one(s) you want to use. Will only use the new book type setting for the next write. Then the default setting will be used. Will use the new book type for the media currently loaded in the drive. As you can see I have a DVD +R disc loaded. Will use the new book type until you reboot your computer. Will use the new book type forever. We want to change the book type to DVD-ROM. The other options are to be used if you want to stop using the book type feature. 'Normal' means that the inserted disc has not had the book type setting changed or modified and 'DVD +RW' is DVD +RW media. If everything worked as it should, the change is made. The next time you write, the book type will be set to DVD-ROM. But as I have a re badged Lite-On drive, I also need to do the 'Advanced' step as shown in section 4.2.13.9 of this guide to get his information automatically in the log. 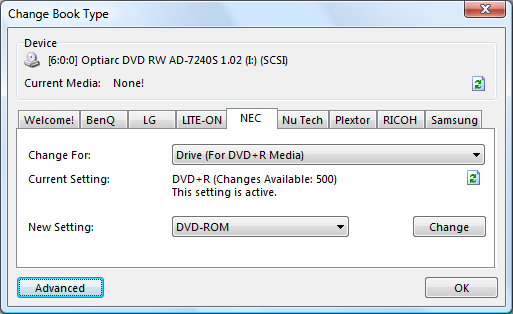 NEC/Optiarc official firmware will by default only book type +R DL media to DVD-ROM and also with official NEC/Optiarc firmware only the options for +R double layer media works in the 'Change Book Type' function. In order to change and use the settings for +R and +RW media, you will first need to flash the drive with a patched firmware, that sets the book type for you and also allows for the options in the 'Change Book Type' function to be fully working. 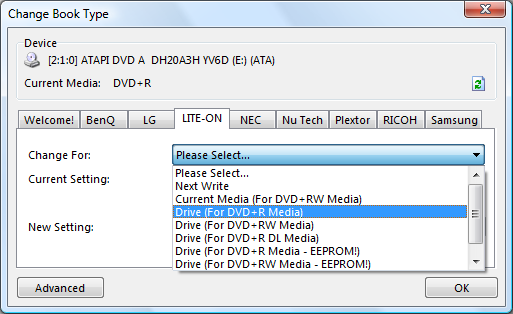 You can read more about how to apply a patched firmware in the 'Book type +R/+RW media on NEC/Optiarc drives' guide. With the patched firmware installed, no further actions in the 'Change Book Type' functions should be needed to carry out. If you have patched firmware installed and also the option 'Auto Change Book Type' enabled, that is located in the ImgBurn settings in tab 'Write', this setting will always wants to book type to DVD-ROM. So if it's enabled, it doesn't matter what the temporary setting is currently set to, the program will still change the temporary setting so it book types to DVD-ROM, that's this settings sole purpose in life. If you do not want this behavior, disable the setting. So if you for some reason temporary wants to disable the book type function to 'DVD-ROM', you need to set both the 'Permanent' and 'Temporary' value to '+R' or 'RW' and also have the option 'Auto Change Book Type' disabled. The available options in 'Change For' are the ones listed below. The book type value you set here here will stay the same even after a reboot of your computer. Sets the book type value to '+R'. Sets the book type value to 'DVD-ROM'. Sets the book type value to '+RW'. Sets the book type value to '+R DL'. The book type value you set here here will stay the same until you turn off your computer. The 'Temporary' value will take its initial value (after a power on of the computer) from the 'Permanent' setting. The 'Active Setting' will also be set to 'Permanent'. The 'Active' option swaps between the 'Permanent' and 'Temporary' setting being the one that actually gets used for the burn. Every time you change the 'Permanent' setting the counter of available changes will be reduced by the number 1. If you wish to restore the counter to the original value of 500 you can do it with this function. It also resets the book type options to factory defaults. Select this value and press the 'Change' button and the original value will be restored. 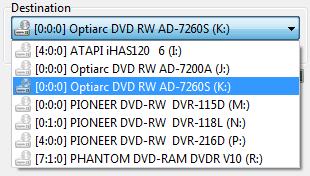 As an example I will use my Optiarc drive AD-7240S to show how to book type +R single layer media to 'DVD-ROM'. Remember that with the patched firmware installed, this step is not necessary. As we want to make a permanent change of the book type to 'DVD-ROM' on +R single layer media, we first select the value 'Drive (For DVD+R Media)'. This will make it remember the new setting even after a reboot of the computer. When we have selected this option, we will now also see the current setting. This setting we want to change to 'DVD-ROM'. 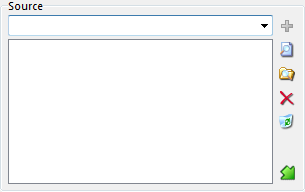 Select 'DVD-ROM' in the drop down list for 'New Setting'. Press the 'Change' button for the change to be carried out and if everything worked as it should, the change is made. The next time you write a +R single layer disc, the book type will be set to DVD-ROM. If you have an OEM drive from, BenQ, LG, Lite-On, NEC, NuTech, Plextor, Ricoh or Samsung, this function makes it possible to add the OEM drive in a table, so that ImgBurn can read the current status settings that you have applied. If you have already applied this in the 'Advanced' feature in the 'Change Advanced Settings' function (section 4.2.12 of this guide), there is no need to do it here as it's the same function. 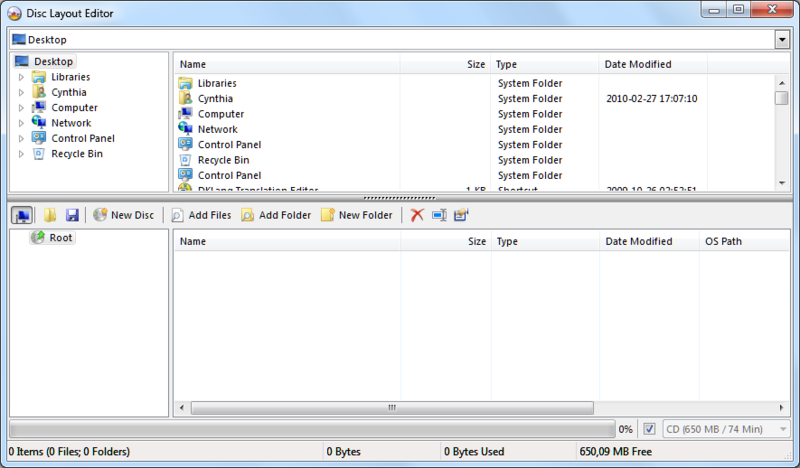 Type in the ID string of your drive as it is visible within the main program window. The next time you write to a disc, you will have the enabled Lite-On book-type feature for the drive to show up in the log. Sets LBA to the last value on the current loaded media. Logical Block Address (LBA) is an addressing scheme; blocks are located by an index, with the first block being LBA=0, the second LBA=1, and so on up to (N-1), where N is the number of sectors on the disk. Only the contents of the 2048 byte User Data Field is showed as default. Jumps to the previous sector. Jumps to the next sector. Refreshes the window and re-reads the LBA from the media. Reads the media in RAW mode, 2352 bytes per sector. Useful for CD-DA media that uses all of the 2352 bytes per sector for audio data. Same as RAW read, but it also includes 96 bytes of sub channel data. On CD-DA they are either filled with nulls or they can be used for CD-TEXT. This function will display the physical layer break information on a double layer disc. This will show you the current 'Regional Code' setting for your drive. 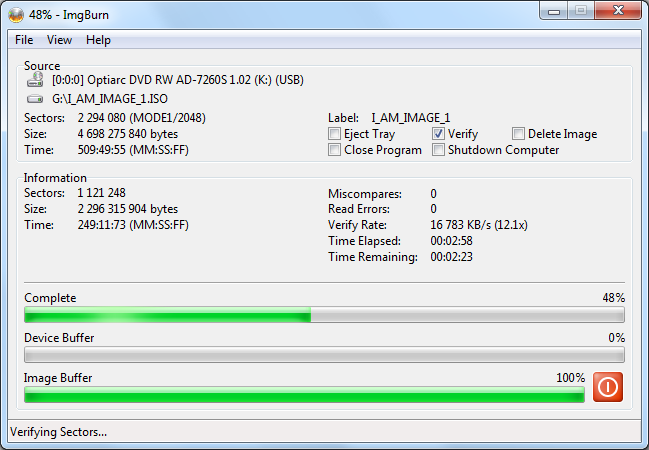 If you should see this window, it will in most cases mean that your drive is flashed with region free firmware. This function allows you to change the current 'Regional Code' for your drive. 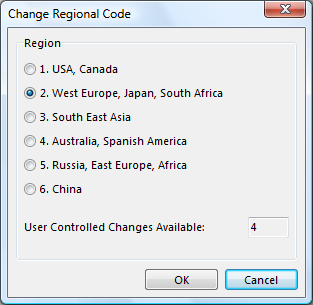 New drives have no 'Regional Code' set, you need to do this by selecting the region that you are living in, or to another region if you want that. Just remember that you can only change this setting five times. The last 'Regional Code' you set it to, will be to that one forever. If you have a NEC drive, it can still be changed by using an external tool such as the 'NEC RPC2 Reset Tool'. 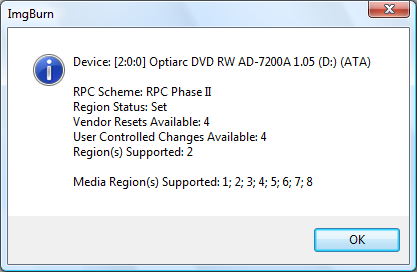 If you should see this window, you can't change the 'Regional Code' because you have a region free firmware installed. This shows your selected drives capabilities. Feature to display the 'Family Tree' of a device - i.e. which controller it's connected to. This function will help you to see if there is a new firmware available for your drive. You need to be connected to the Internet in order for it to work. The program searches 'Firmware HQ' and shows you available firmware updates for your selected drive. It also shows you the current installed firmware version. If you find a new firmware version, think of this before you do the update. No disc in the drive. Don't turn off the power during the update. When the update is done, restart your computer. This function supports non-stop 'queued' burning from a changer device like the Sony VGP-XL1B2(3) and the Acronova 'Nimbie', Primera Technology, Inc. and the Vinpower Digital's RipBox, series of auto loaders. This function is not covered in this guide, but you can read more in these guides. How to get your Acronova Nimbie USB auto loader working in ImgBurn. How to get your Primera Technology auto loader working in ImgBurn. 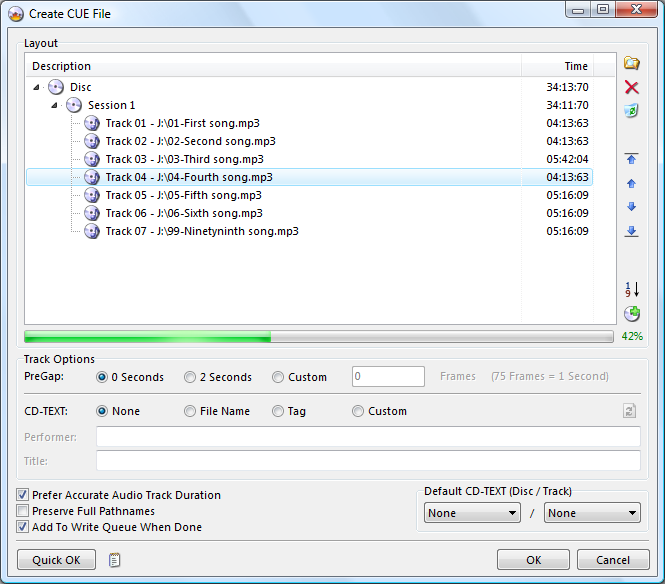 The 'Create CUE' function allows you to compile an Audio CD. A cue sheet, or cue file, is a meta data file which describes how the tracks of a CD or DVD are laid out. Cue sheets are stored as plain text files and commonly have a '.cue' filename extension. For an Audio CD, a cue sheet specifies titles and performers for the disc and its tracks as well as the names of one or more audio files to be used. Cue sheets are also used for many types of CD's in conjunction with an image file. The image file generally has a ".bin" extension. Use the this button to browse to a folder and select one or several sound files that you want to be loaded into the track list. Removes one or several selected tracks from the list. These arrows allows you to move around the selected track(s) in the session track list order. Moves the selected tracks(s) to the top. Moves the selected tracks(s) one step up. Moves the selected tracks(s) one step down. Moves the selected tracks(s) to the bottom. Sorts the listed tracks in the tags track number order. PreGap allows you to see the amount of space (silence time) that should be before this track is played. If you want 4 seconds, then select the option 'Custom', and add the value 300 (4 sec x 75 frames). The default setting is '0 Seconds'. CD-Text adds the ability to store information like album titles, artist names, and song titles on an Audio CD. CD-TEXT will not be compiled on your Audio CD. The name of your source file will be used as the tracks 'Title'. By pressing the refresh button, the name will be re-read from the source file. The current tag of your source file will be used as the tracks 'Performer' and 'Title'. By pressing the refresh button, the tag will be re-read from the source file. Allows you to set the 'Performer' and 'Title' to whatever you want. 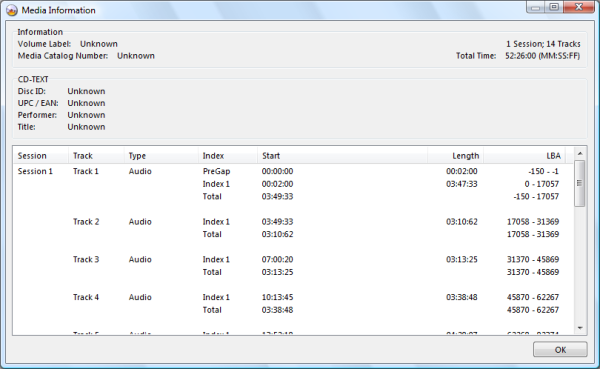 This makes the program analyse the audio files properly as they're added to the list. Preserves the full path of the file. If you disable this setting you will only get 'My song.mp3' and not something like 'C:Desktop\My music\My Song.mp3'. If you want all the CUE files in one folder and the audio files in another, you need the preserve full pathnames option ticked or it won't be able to find the files (it only looks in the current folder for them). When the CUE file is created, you can automatically have it added to the 'Write Queue' list. This function is explained in section 2.4 of this guide. You can set the default CD-TEXT to be used when you import new tracks. Saves the created CUE file to the location that was last used for adding a file and uses the first tracks title as the name of the file. If you want to decide the name of the file and where to save it, you need to use the 'OK' button to achieve this. 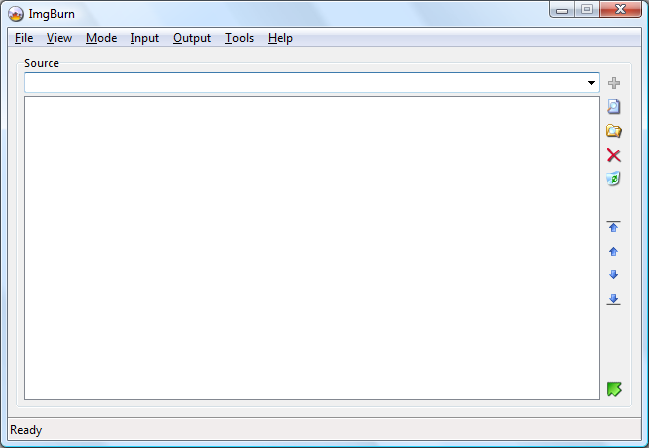 Displays the compilation in a notepad window.. 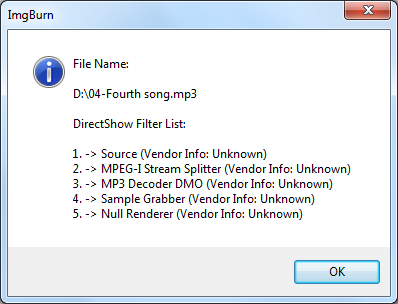 Note: If you right click in the 'Layout' box within the 'Create CUE File' window and when an audio track is selected, this will give you a list of the filters that DirectShow will be using to decode your file into a format ImgBurn can use. You can read more abut this function in the 'How to burn an Audio CD from music files using ImgBurn, Supported files include Ape, Flac, Ogg, MP3, Wav and Wma' guide. In the past the .DVD file was needed for mounting HD-DVDs and BDs when using Virtual CloneDrive. The file contained the MediaType of the ISO image and told Virtual CloneDrive what type of image it was mounting. Recent versions of Virtual CloneDrive now detects the UDF directly from the ISO image so the .DVD file is no longer necessary. The .DVD file is also used to contain information used by CloneCD when burning DVD data to a disc; usually only a few bytes in size, but required to burn data to a disc; saved along with much larger data files, typically with extensions ".i00," ".i01," ".i02," etc. 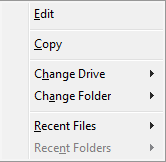 Use this button to browse to a folder and select one or several files that you want to be loaded into the program. Removes one or several selected files from the list. Removes all files from the list. These arrows allows you to move around the selected file(s) in the list order. Moves the selected file(s) to the top. Moves the selected file(s) one step up. Moves the selected file(s) one step down. Moves the selected file(s) to the bottom. Set the LBA for the layer break position for a dual layer disc image. For Microsoft Xbox games it should be set to the value 1913760. The Track Path options (PTP or OTP) are not available in the 'Create DVD File' function. Specifies the type of media that's been used to create the image. Preserves the full path of the included file(s). If you disable this setting you will only get 'Demo.i00' and not something like 'C:Desktop\My Movies\Demo.i00'. When the .dvd file is created you can automatically have it added to the 'Write Queue' list. This function is explained in section 2.4 of this guide. Saves the created .mds file to the location that was last used for adding a file and uses the first files name as the name of the file. If you want to decide the name of the file and where to save it, you need to use the 'OK' button to achieve this. This function is useful in three occasions. You have a set of files with extension like .i00, .i01 and miss the .mds file, which holds the information on the parts. You need to set the layer break for a dual layer disc image. You have an ISO file that is under 1GB in size, hence the MDS file is needed so that DAEMON Tools etc will switch to 'DVD' mode rather than being in 'CD' mode. You also have the ability to specify the Track Path for a double layer image to either 'Parallel Track Path' (PTP) or 'Opposite Track Path' (OTP). 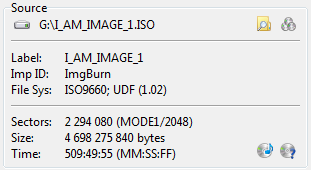 ImgBurn can't burn as PTP, but it can make MDS files where a DL image has the PTP flag set. This MDS can then be mounted in DAEMON Tools and the virtual drive will then be emulating a PTP DL disc (rather than being forced to an OTP DL one). Replication plants or professionals with proper hardware / software could then use the virtual disc as the source for a client or whatever. Dual-layer DVDs which have both layers recorded as clockwise spirals which start from the inside of the disc. A dual-layer DVD standard which defines layer 0 as being written in a spiral track starting at the inside of the disc, and layer 1 having a spiral track which starts at the outside of the disc. Both tracks are written so that the DVD player will rotate the disc in the same direction. This enables the DVD player to switch from one layer to another more quickly at the end of layer 0. When the .mds file is created you can automatically have it added to the 'Write Queue' list. This function is explained in section 2.4 of this guide. This function rebuilds the SCSI/ATAPI device map, so that ATAPI devices allows to be translated as a SCSI generic device and allowing ImgBurn to recognize it as a SCSI device. This function is only available in Windows 95/98/Me. Searches your computer for installed devices, such as CD/DVD writers and DVD-ROM's. The 'Automatic Write Speed' (AWS) function is useful if you want ImgBurn to remember the default write speed for a certain brand of media or combination of media and drive. So you can set different default write speeds for the same media, if you have more than one drive installed. If you have added media in this function and want to use it, you also need to have write speed set to 'AWS' when you burn your discs through the 'Build', 'Write' and 'Discovery' modes. 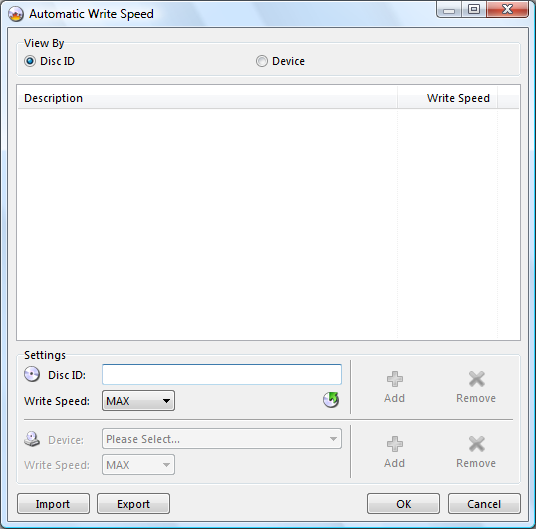 Insert a blank disc that you want to be added to the 'Automatic Write Speed' function. Press the button to load the current media's 'Disc ID'. 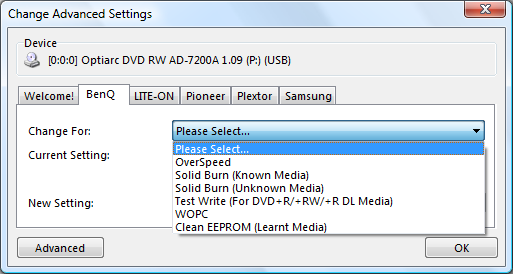 You can also add 'DVD-R' and it'll burn all DVD-R (that aren't otherwise specified) at whatever speed you select. The same can be done for 'DVD+R'. Select the write speed that you want to use for this media. Adds the loaded media to the list of media. Updates your changed settings for the selected media. Deletes the selected media from the media list. 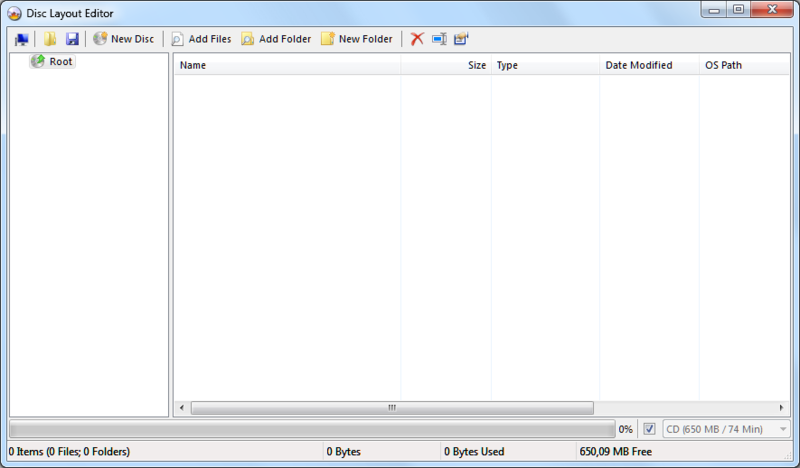 By selecting an added media you can add it to one or more drives. In this way you can have individual write speeds for different drives for the same media. Select the drive that you want to add a different write speed for, instead of the default one. Select the write speed that you want to use for this media, when it's burned with this drive. Adds the loaded combination of media and drive to the list of media. Deletes the selected media from the media list for this drive. This changes the view order, so you can see the media codes attached to your drive(s). If you have added media for currently not attached drives, such as an USB drive, this setting allows you to see such drives also. You can read more about this function in the 'How to use the 'Automatic Write Speed' feature' guide. Windows 2000, Windows XP, Windows Vista and Windows 7 provides a layered approach to device drivers. Filter drivers are optional drivers that add value to or modify the behavior of a device. A filter driver can service one or more devices. 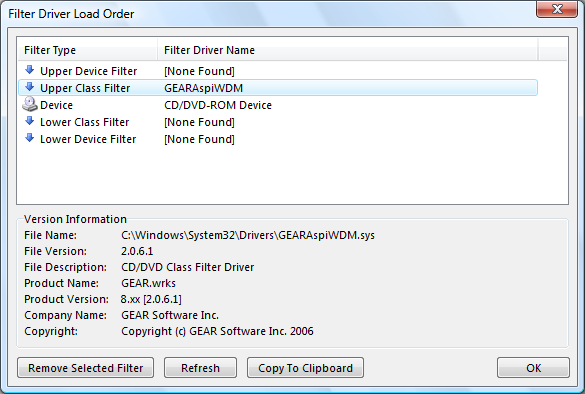 Filter drivers are often used to extend or alter the normal capabilities of Microsoft's CD/DVD device driver (function driver). This function will show you all installed filter drivers above and below any CD/DVD devices detected on your system. It scans for and lists device class filters found in all the relevant 'CdRom' keys under 'HKLM\SYSTEM\CurrentControlSet\Enum\[iDE|SCSI|USBSTOR|1394]'. Use the 'Remove Selected Filter' button with care, as the driver will be instantly removed from your system After you have removed a filter, restart your computer. This function is not available in Windows 95/98/Me. This function will set the data transfer settings of all your drives including your CD/DVD drive's IDE channel to Direct Memory Access (DMA). DMA in compared to the older Programmed Input/Output (PIO) data transfer mode is faster and a newer method. This may fix drive issues such as burning and reading difficulties. Works in Windows XP, probably also in Windows 2000 and NT. Does no harm if the Windows version is incompatible, as you can see in the following example when the function is performed on a Windows Vista computer. Links you to the Uniblue SpeedUpMyPC web page. You need to be connected to the Internet when you use this function. Links you to the Uniblue DriverScanner web page. You need to be connected to the Internet when you use this function. Links you to the Uniblue RegistryBooster web page. You need to be connected to the Internet when you use this function. 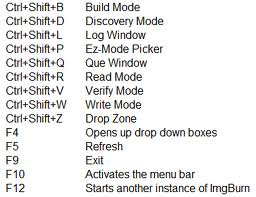 This will give you a menu of the different settings that you can apply to the program. These settings are explained in the guide 'The ImgBurn Settings'. 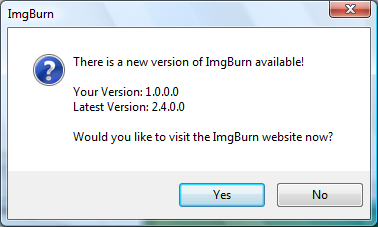 Checks if there is a new version of ImgBurn available. If there is a new version and you press the 'Yes' button, it will open up your Internet browser and load the 'ImgBurn Download Page'. If there isn't any newer version, you will be told so. You need to be connected to the Internet when you use this function. Opens up the Guides section of the ImgBurn forum in your Internet browser. You need to be connected to the Internet when you use this function. The 'ImgBurn Download Page' opens up in your Internet browser. You need to be connected to the Internet when you use this function. This will open up your Internet browser and connect you to the ImgBurn Website. You need to be connected to the Internet when you use this function. This will open up your Internet browser and connect you to the official ImgBurn Support Forum. You need to be connected to the Internet when you use this function. This will open up your Internet browser and give you the opportunity to donate some bucks to the author of this program. You need to be connected to the Internet when you use this function. Opens up the 'ImgBurn Graph Data' folder. It will use the path that you have specified in the tab 'File Locations' in the 'Settings' window. See section 4.15 of this guide. 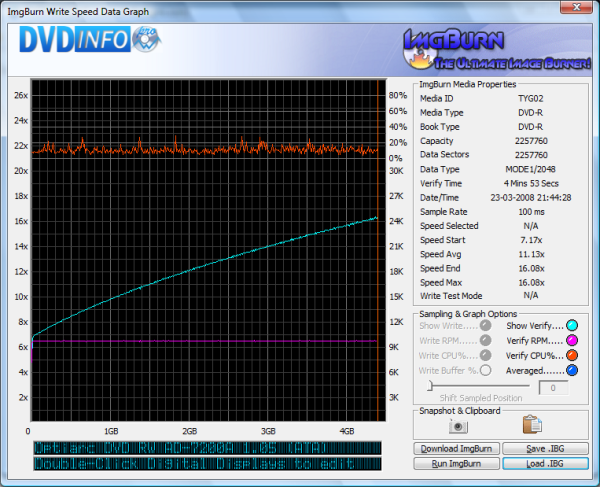 'ImgBurn Graph Data' is information collected during read, write and verify tasks. This information can be viewed in in either BurnPlot, DVDInfoPro or Opti Drive Control. Opens up the 'ImgBurn Images' folder. It will use the path that you have specified in the tab 'File Locations' in the 'Settings' window. See section 4.15 of this guide. Opens up the 'ImgBurn Logs' folder. It will use the path that you have specified in the tab 'File Locations' in the 'Settings' window. See section 4.15 of this guide. Opens up the 'ImgBurn Projects' folder. It will use the path that you have specified in the tab 'File Locations' in the 'Settings' window. See section 4.15 of this guide. 'ImgBurn Projects' files are saved information on applied settings, that you have done in the 'Build' mode for a project. By loading a saved file, you can return to the status of a previous build. Opens up the 'ImgBurn Queues' folder. It will use the path that you have specified in the tab 'File Locations' in the 'Settings' window. See section 4.15 of this guide. Assume that you have added some files for later burning to the 'ImgBurn Queue'. When you close down ImgBurn that information should normally be gone, by loading a previously saved 'ImgBurn Queue' file, you can return to the status of that queue again. You can reset the counter by pressing the 'Reset ImgBurn Statistics' button in the tab 'General' in the 'Settings' window. See section 4.15 of this guide. 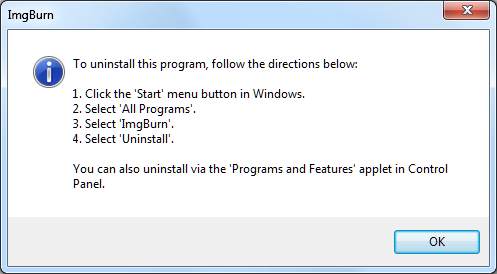 A description on how you uninstall the program from your computer. This will show you the program version that is currently installed and contact information.